Japan Inc. faces unprecedented pressure to shape up. Lasting success would bring an enduring boost to return on equity. First comes a tough round of shareholder meetings. Next expect more buybacks, stake sales, and new targets. Then the hard work of bolstering businesses and consolidating fragmented sectors will begin. Prime Minister Shinzo Abe sees fixing corporate Japan as key to a wider economic overhaul – a “third arrow” to complement money-printing and increased public spending. Officials are taking aim at everything from supine investors to insider-only boards and bloated balance sheets, with a special focus on lifting the corporate sector’s slender returns. This is a real headache. ROE for the MSCI Japan index averaged just 4.5 percent over 20 years, Datastream shows. 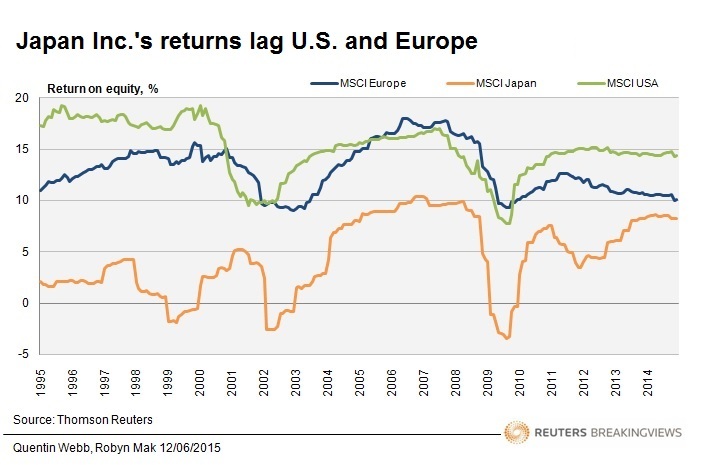 U.S. corporations managed returns more than three times higher over the same period. A blizzard of initiatives is already taking effect. Japan’s financial regulator has supported new stewardship and corporate governance codes which urge investors to act more like owners and prod companies into hiring outside directors. The stock exchange and publisher Nikkei have launched an index which excludes ROE stragglers. ISS, the influential proxy adviser, is also pushing for better returns and governance. On the buyside, Abe has persuaded the country’s $1.1 trillion government pension fund to support the drive, prompting others, including once-shy life insurers, to join in. Foreign investors are onboard too. Japan provided the majority of stock picks at the hedge fund industry’s recent Sohn / Karen Leung Foundation fundraiser in Hong Kong. But Japan has been here before, with much hype about ROE and reform in both the late 1990s and mid-2000s. Neither period produced much lasting change. Today’s momentum looks stronger, but how can investors gauge if the change is real? The most encouraging sign so far is that blue chips like Japan Tobacco, NTT Docomo and Nippon Steel & Sumitomo Metal seem to be listening. Many have already published explicit ROE targets. Dividends and share buybacks are surging. Large Tokyo-listed firms bought back 3.2 trillion yen ($26 billion) of stock last year, Goldman Sachs analysts say, up 60 percent on 2013. The next test, in coming weeks, will be hundreds of annual general meetings for companies whose financial years end in March. ISS recommends voting against leaders at Nintendo, Sharp, Sony and others where ROE has persistently undershot 5 percent. A dissenting majority could theoretically eject the boss. The revolt is unlikely to go that far. Even so, big protests would hurt – and show fund managers mean business. Backlashes at smaller outfits which have fewer foreign owners would be especially notable. At AGMs and afterwards, expect plenty more companies to lay out their medium-term plans, complete with capital allocation and return targets. It helps that Japanese companies typically hoard far more cash, land and securities than Western peers. Lightening up on cash is simple. Exiting shareholdings will require more finesse, but should still be doable. Fully 18 percent of listed Japanese companies by value is in the hands of other corporations, Deutsche Bank reckons. Yet financial engineering alone does not build sustainable, world-beating enterprises. The bigger question is whether chief executives can transform underlying businesses. That means jettisoning superfluous units, and working out how to boost sales and margins while the Japanese market keeps shrinking and growing older. That could entail better pricing, budgeting and product development. Mergers and acquisitions could also play a big role. One solution might be buying more overseas, even though Japanese corporations have a reputation for overpaying and under-managing. Domestic consolidation could reduce overcapacity in industries such as banking, home to a long tail of smaller lenders. But restructuring, both internally and via M&A, could prove controversial. Activist investors could be a catalyst, too. They have already scored some victories. Insular robot-maker Fanuc hiked dividends after a campaign by U.S. cage-rattler Dan Loeb. And Nintendo belatedly moved into mobile gaming following pressure from Oasis Management, a Hong Kong-based fund. The agitators are now thinking bigger: Seth Fischer of Oasis told the Sohn conference he wanted ceramic technology specialist Kyocera to ditch a woeful U.S. phone unit and set up a “YieldCo” that would buy its own solar panels. If these bolder demands also find an audience that will be another sign Japan Inc. is really changing. Institutional Shareholder Services has recommended voting against the heads of Sharp and Sony, because both Japanese electronics firms were failing to meet its return criteria. The influential proxy adviser said on June 10 that shareholders should vote against Sharp Chief Executive Kozo Takahashi and incoming Chairman Shigeaki Mizushima, and Sony CEO Kazuo Hirai, at the companies’ annual general meetings on June 23. ISS recommends voting against top executives at Japanese groups that have made a sub-5 percent return on equity (ROE) over the last five years. In April an ISS executive said he expected about a quarter of Japan’s listed companies would fail to clear that hurdle this year. Many speakers at this year’s Sohn Hong Kong conference, presented by the Karen Leung Foundation and held on June 3, focused on the opportunities from corporate reform for Japanese equities. Hedge funds and money managers including ARCM, Hutchin Hill, Ichigo, Indus, and Oasis highlighted stocks such as Aoyama Trading, Coca-Cola West, Kyocera and Tokyo Broadcasting System.